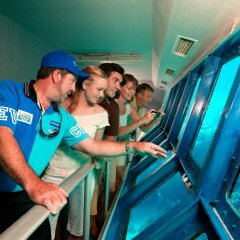 Save $111.00 on our Great Barrier Reef and Kuranda Combo Family Package Tour Deal. 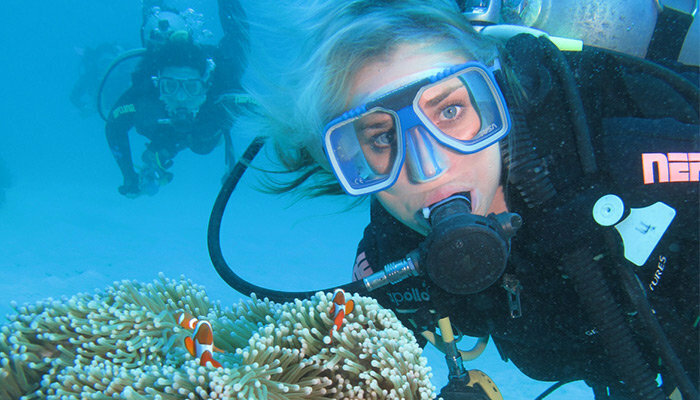 Take a Great Barrier Reef tour on day 1 and an iconic Kuranda village tour on day 2. 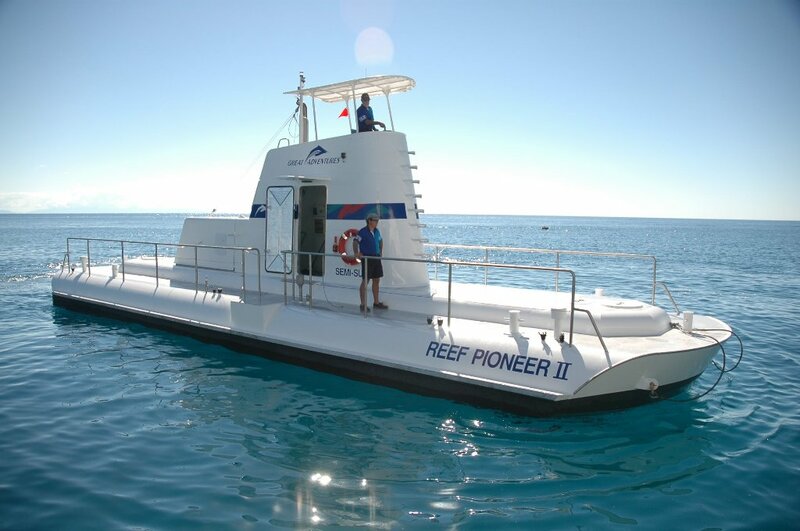 Your reef tour takes you to an outer Barrier Reef activity platform where you will can enjoy a submarine tour, unlimited snorkelling, try scuba diving, or take a scenic helicopter flight. 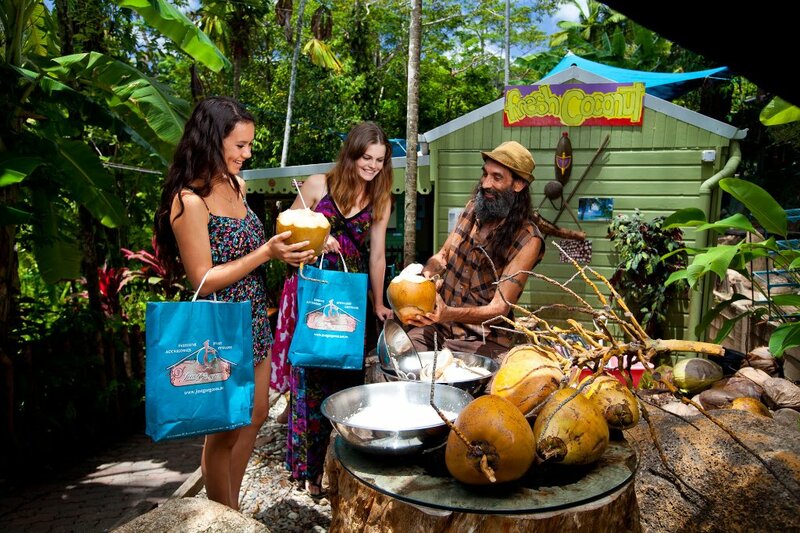 The next day you visit Kuranda rainforest village travelling on the Skyrail and Kuranda train, both of which are considered to be the highlights of the Kuranda rainforest experience. 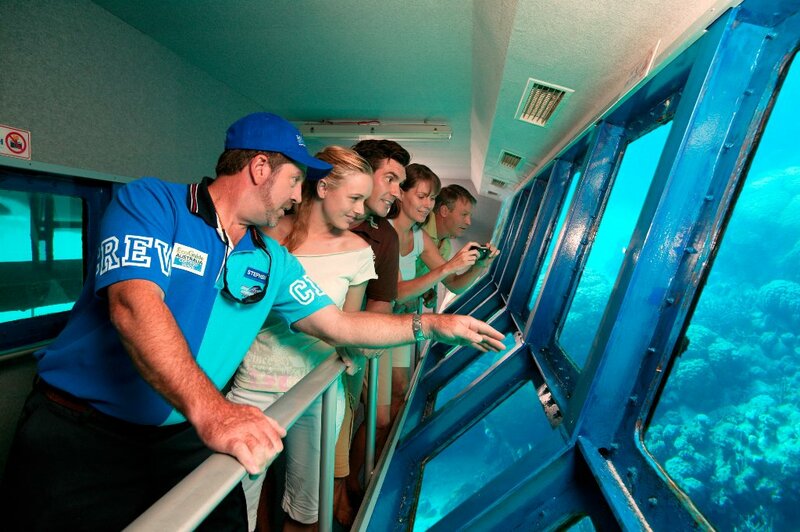 Save $111.00 on our Great Barrier Reef and Kuranda Combo Family Package Tour Deal. 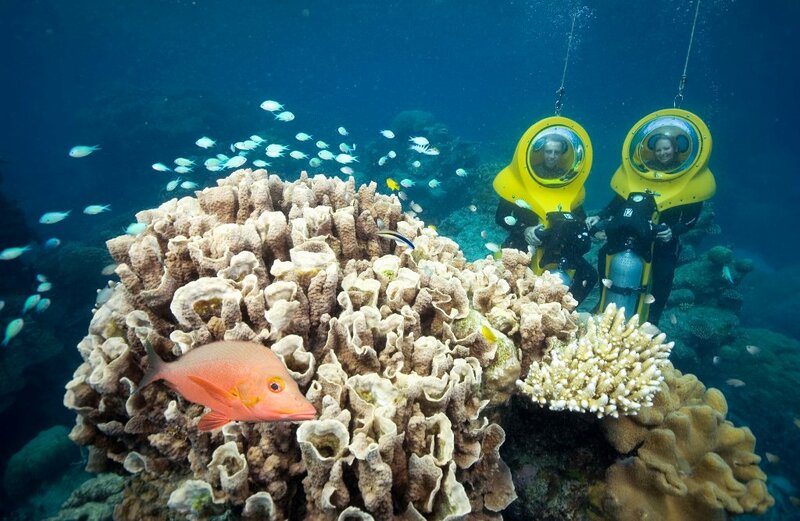 Two of Cairns’ most popular tours, the Great Barrier Reef, and Kuranda. 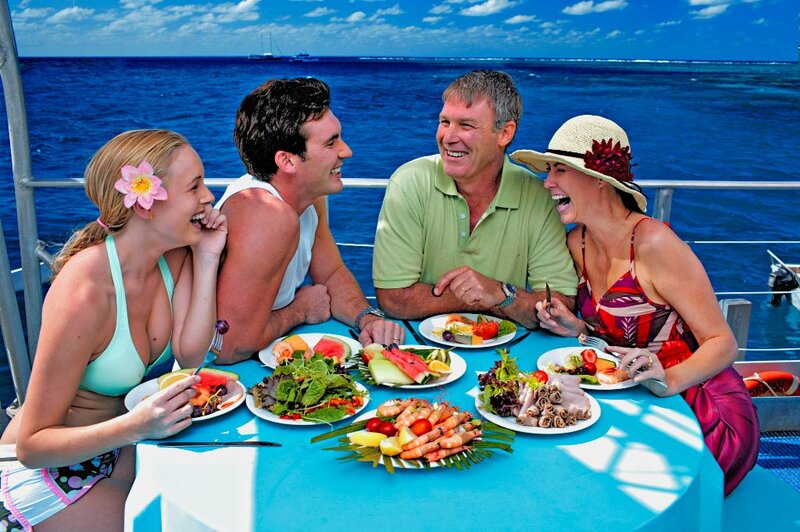 We put the package together for you and take care of the all the details such as coach transfers, meals, park fees and other items so you can just relax and enjoy the tours knowing you have this adventure ahead of you and you save money. 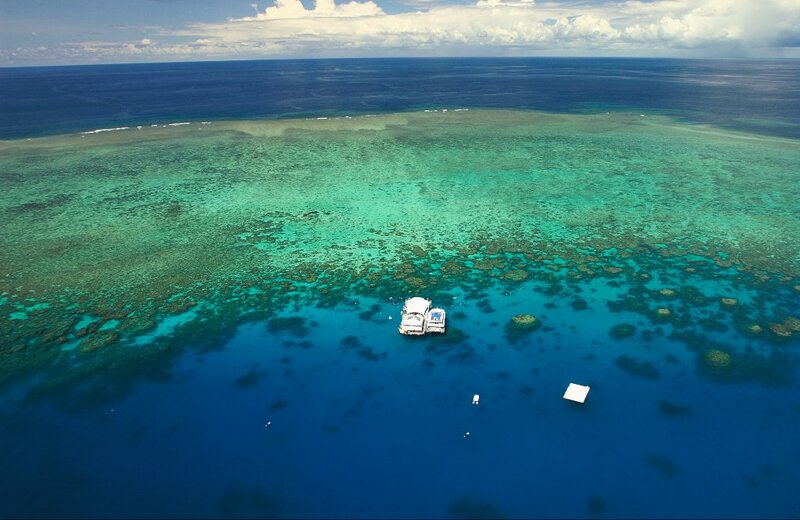 You may choose to make your own way to the Reef Fleet terminal in Cairns for check-in by 9.30am or we shall arrange a coach transfer from your holiday accommodation. 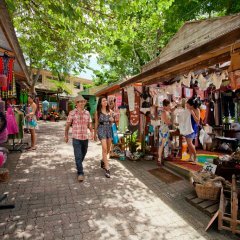 The boat marina is within easy walking distance from most Cairns CBD hotels. 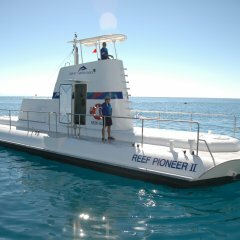 Your Great Barrier Reef tour departs at 10.30am and just 90 minutes later you will be on the outer Barrier Reef activity platform ready for a day of discovery and adventure. 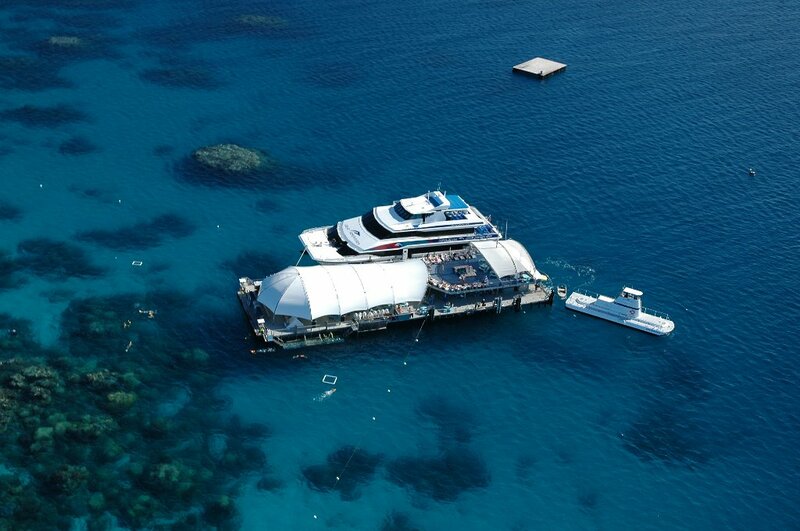 On the pontoon you will have 3 hours full of adventure; including snorkelling, semi-submersible submarine tour, underwater observatory, marine biologist presentation, lunch, morning and afternoon tea. 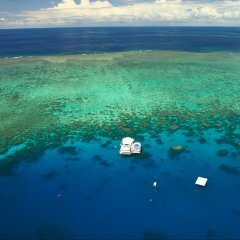 There are many optional extra things to do on you Great Barrier Reef tour such as scuba diving, guided snorkel tours, Scuba-Doo underwater scooters and even scenic helicopter flights. 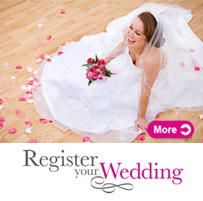 Optional extras must be pre-booked to be sure you are not missing out, seats are extremely limited. 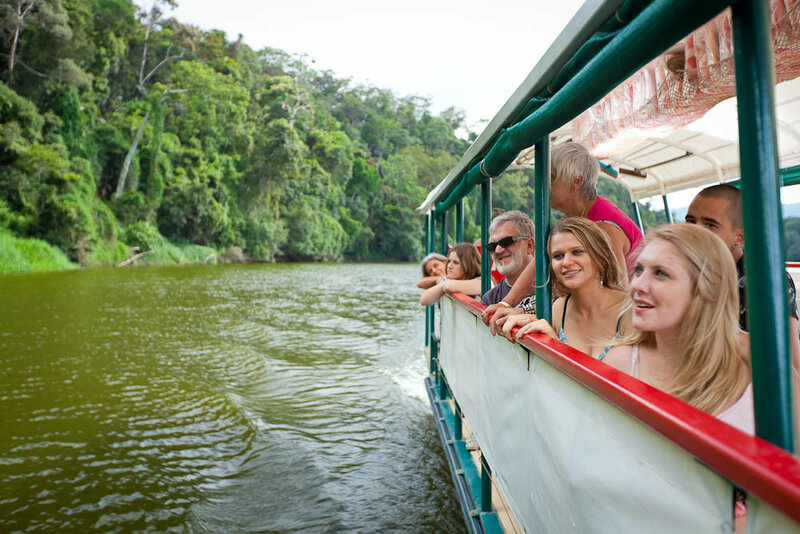 Your day starts with a coach transfer from your holiday accommodation and you will be heading to the Freshwater train station where your Kuranda train journey departs. 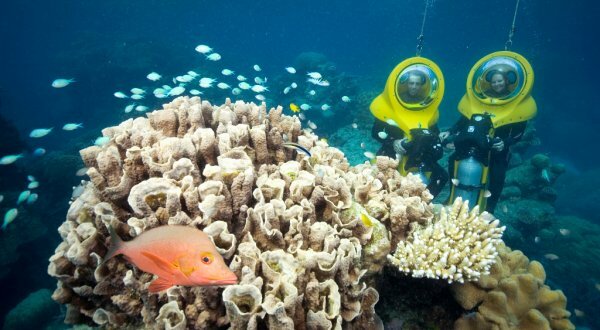 This historic journey takes you thru hand-hewn tunnels in mountain sides, across bridges with deep gorges below, past waterfalls and wonderful rainforest scenery. We take a short stop at Barron Gorge for guests to alight from the train to take photos. 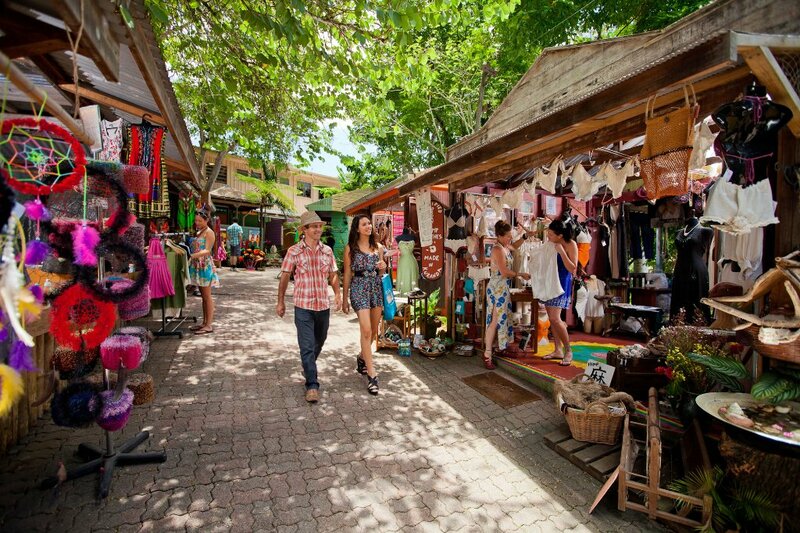 Next it’s back on the train to Kuranda where you have plenty of free time to visit the Kuranda Markets, Koala Gardens to cuddle a koala, Butterfly Sanctuary, Birdworld and other attractions and have some lunch in one of the quirky cafes or restaurants. 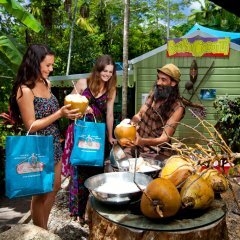 You return journey to Cairns is on the award winning Skyrail rainforest gondola on a- scenic 7.5km cable car ride over the tops of the trees in the rainforest. This gondola ride offers two stops at scenic lookouts on the way down. When you reach the bottom of the mountain we will have a coach transfer waiting to return you back to your holiday accommodation. 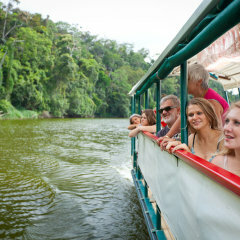 There is an option to upgrade to Gold Class carriage when travelling on the Kuranda train. Gold Class carriage features comfortable club style seating, cheese and snack platters (all locally sourced), high quality Australian beer and wine, coffee and tea. 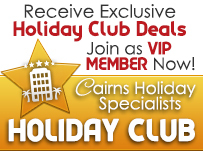 Gold Class is available only on 9.50am and 3.30pm train departures. 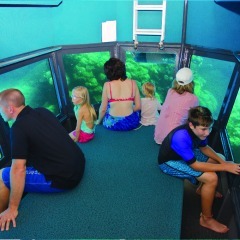 Make your Skyrail ride even more exciting with a Diamond View upgrade. 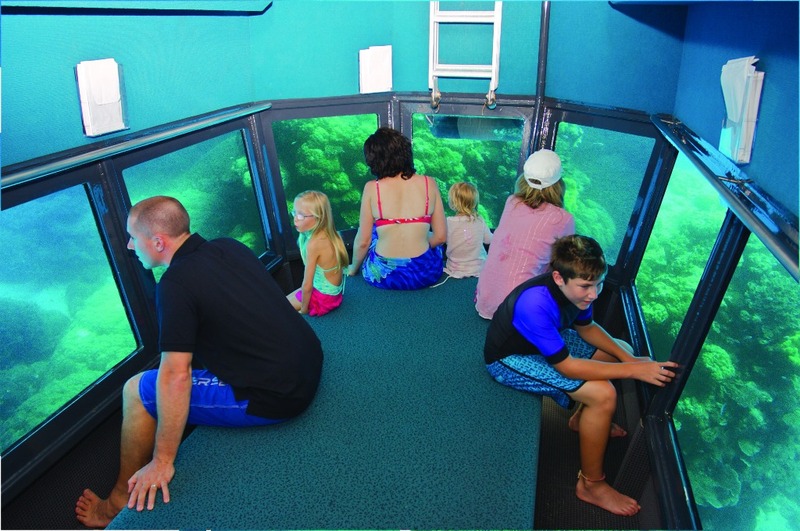 Diamond View gondolas have see-through glass floors, offering excellent photo opportunities. 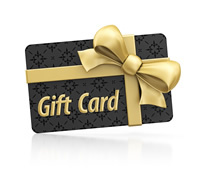 Day 1: Sunscreen, Hat, Sunglasses, Swimming costume, Towel, Cash or credit card, Camera, Souvenirs available for sale on board the boat. 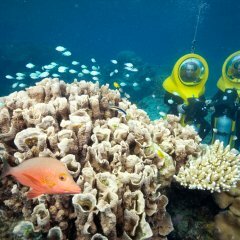 A Government Environmental Management Charge is levied for all adults and children 4 years and over entering the Great Barrier Reef World Heritage area. 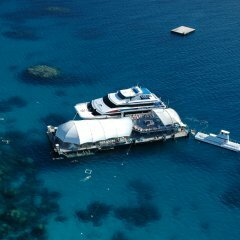 This charge is payable direct to Reef Operator on check-in. Take a light jacket when travelling cooled winter months (May-September) as temperatures are often lower in the mountains.